2 Times Wild Classic Slot Guide & Review - Casino Answers! 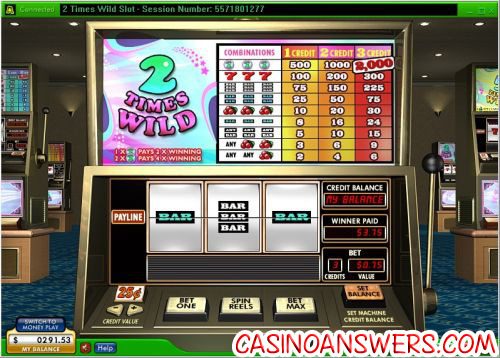 2 Times Wild is a 3-reel, 1-line classic slot machine featuring a wild symbol and multipliers. You can play the 2 Times Wild classic slot machine at Lucky Ace Casino and 888 Casino. Bets on the 2 Times Wild slot machine are $0.05, $0.25, $0.50, $1 and $2. Hit “Bet One” to bet one or two coins followed by the “Spin Reels” button or hit the “Bet Max” button to play all three coins. The lowest total bet you can make on the 2 Times Wild is a nickel per spin up to the highest total bet of $6 per spin. The lever on the slot machine is functional, so you can spin the reels using that if you wish to. The 2 Times Wild symbol is the highest paying symbol on the 2 Times Wild slot machine. On a 3-coin maximum bet, it will pay out 2000 coins if you hit three symbols on the payline. The 2 Times Wild symbol is (not surprisingly) wild and will substitute for all other symbols in the game. When the symbol completes a winning combination, it will double your winnings. When two symbols complete a winning combination, it will quadruple your winnings. The 2 Times Wild is easily the most valuable symbol on the slot machine and one you should definitely be looking for when playing 2 Times Wild at Lucky Ace Casino. There are 9 winning combinations on the 2 Times Wild classic slot machine. The full payout schedule is as follows (1/2/3 coin payouts in parenthesis): 1 Cherry symbol (2/4/6), 2 Cherry symbols (3/6/9), 3 of any Bar symbols (5/10/15), 3 Single Bar symbols (8/16/24), 3 Cherry symbols (10/20/30), 3 Double Bar symbols (25/50/75), 3 Triple Bar symbols (75/150/225), 3 Seven symbols (100/200/300) and 3 2 Times Wild symbols (500/1000/2000). 2 Times Wild gives you exactly what it advertises. The wild symbol is a 2X multiplier. There are no hidden surprises. What you see is what you get with the 2 Times Wild slot machine. To play it, sign up and make your deposit at Lucky Ace Casino! Can USA players play the 2 Times Wild classic slot game for real money? Unfortunately, Random Logic online casinos are not accepting players located in the United States of America for real money. For another classic slot that is a lot like 2 Times Wild, check out our Double Gold Classic Slot Review at the USA-friendly Caribbean Gold Casino. Where can I play the 2 Times Wild Flash Game?